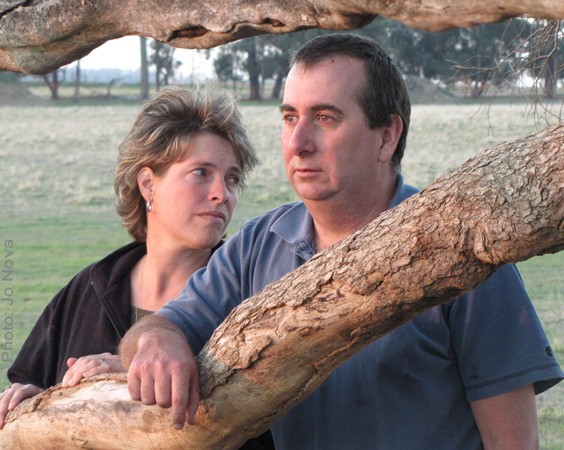 Could an honest hardworking couple emigrate to Australia with money, expertise, and create a popular and profitable business, but be destroyed by a few vocal activists with help from an government department? The government agreed with their plans, the Thompson’s followed every rule, broke no law, and there are no outstanding infringement notices, but the plans and rules kept changing. After they had put their money and hearts on the table the department added conditions that no one could meet, dangling them by a thread month after month as the Thompsons complied but the debts piled up. They passed all the tests, have local support, but they are being driven to bankruptcy by the Department of Environment and Conservation of WA. Could this really happen in Australia? It’s a form of torture. Whatever happened to a fair go? It will list all the main stories, articles and sources of information on the saga of The Thompsons. Examples of letters (with email address of the WA parliament). Calls, offers to help and donations are coming in from all over the world. People are appalled at the treatment the Thompsons have received. Australia’s sovereign risk is being discussed. Watts Up With That has been providing fantastic support to The Thompsons in A Call To Action for the WUWT Community! The summary | The history | A suicide | A question of undeclared conflict of interest | You tube videos where the Thompsons tell their story. This post is a good place to start. Did you know in Australia it’s possible to ruin a business if you don’t like the way it smells? This is a heartbreaking story — that a government could effectively ruin a family by slowly strangling them in red tape, and that they would have apparently no protection from the courts. Cows and complaints don’t correlate. See the graph of the empirical evidence on the Thompsons case; the complaints, the cows, the recorded smells. 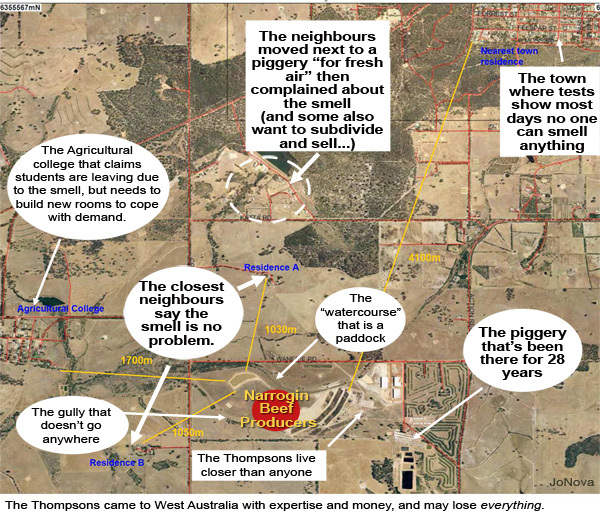 Compare the Thompsons feedlot with others in the US which are 4 – 8 times larger and closer to towns. Have the Thompsons been treated unfairly, are the complaints legitimate? Could we tell? Have green government officials targeted a family farm because they are vocal skeptics? This is a family with four young children, who ran a profitable business; they filled in every form and ticked every box. 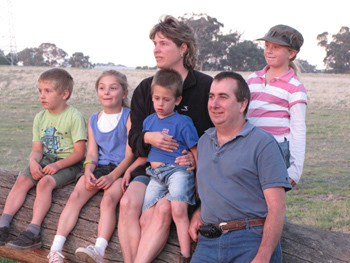 They have broken no laws, and there are no outstanding environmental notices, but yet, they came to Western Australia with their life savings and they are losing everything. After years of government red tape, delays, and impossible requests the bank has given them 4 days to pay up. See the ridiculous application of laws that are supposed to protect the environment. 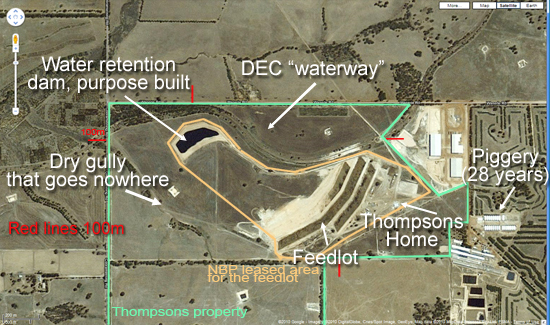 The Thompson’s case and all their pain depends on a paddock being listed as a watercourse. They have, in effect, lost it all because in a 100 year flood, water from this paddock might possibly reach a salt pan 10 km away. This is not about the environment. This post includes maps of the property and surrounds. 5. Minister of the Environment and Queen of WA? Here’s the key clause that pretty much gives total control over all businesses in WA to the Department of Environment and Conservation (DEC). Condition A1 is an all encompassing point recently added to the Thompson’s license. It’s a sweeping clause, and measured entirely with opinions. Anyone with the right to say Yay or Nay to what is “unreasonable” is effectively the ruling monarch. Narrogin is a town of around 5,000 people. In April 2007, 900 people signed a petition in support of them, and their two nearest neighbors have written letters declaring it’s a valuable business and they want the feedlot to stay and grow. The support is not just that the feedlot should operate at 10,000 head, they all put their names to increasing it to 15,000. Locals give Matt money in the street and tell him to fight on, the complainants live further away than the strong supporters (who say the odour is no problem), and the piggery was operating right next door for all those years before The Thompsons even started and before the neighbours moved in. Examples of letters to politicians, editors and news outlets. See also This list of WA politicians. Senator Bernardi is not even a Senator from the same state as the Thompsons, yet he has gone out of his way to find out some of the information behind the case, and raised the issue in Parliament. It’s the mark of a man of principle. Senator Cory Bernardi is a Senator for South Australia. This comes from the DEC’s itself: they have a standard procedure, and they didn’t follow it for the Thompsons. Here are what I believe are the most damning critical passages of the whole Thompson case, and they come from the minutes of a meeting with DEC and the Thompsons held in December 2009. DEC, deceptive, duplicitous, or just clueless about money? The DEC fight back with deception, bogus licenses (that no bank will loan money against), ask for things that have already been done, and turns a blind eye to the killer fine print clauses that make them kingmakers with veto rights over any business in the State. This is a PR war. UPDATED: Dates for the West Australian Speaking Tour below The Thompsons protest on Monday was moving. Janet Thompson delivered one of the best speeches I’ve heard at a protest. I was going to copy parts of it and attach the full speech in documents. But so much is worth saying, I’ve put it here almost in entirety. The Thompsons have spent most of 2011 in legal battles against both the NAB and the DEC.
DEC replies: All they have are unpublished complaint-mail and an unbankable license. This post explains why the current license is unbankable and unworkable. DEC can pretend to “help” business and be “Green” at the same time. No business could run with this license. To read hundreds of comments on this case, see the links above. An update on the plight of the Thompsons | Watts Up With That? 21 complaints and an idiotic bureaucracy – enough to ruin a life, a livelihood, and a family home | Watts Up With That?